Mandated Reporting starts on December 11th, 2017. We are working to update our materials and resources with the new requirements. In the meantime, here are some resources that may be of use for services. E-Learning : Introduction to Children First. Everyone in the sector including all owners, boards of management and early years staff are being asked to complete this online course which provides introductory information on child protection and mandated reporting. This short video below introduces the e-learning module is Facebook/Twitter friendly. It covers what is in the module. Always Children First Child Protection Training: A note on child protection training. 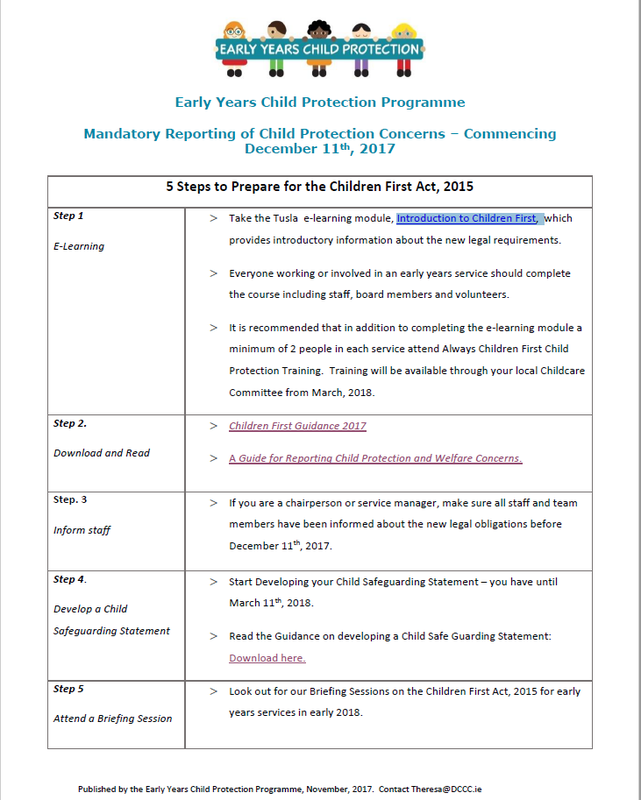 The e-learning module is an introductory course on child protection and includes information on mandated reporting. In addition to this Wicklow County Childcare Committee will continue to offer early years services child protection training. Always Children First will be updated and training will commence again in Q2 of 2018.